This video shows how to create a figure with Elemento in 3 steps. Matrix nodes are used to attach graphics to control points. In this article I'll try to explain how they work. 1. A matrix node influences the coordinate system of sub nodes. When you move matrix1, all sub nodes also move. Since the matrix itself is invisible, it works perfect as a group tool. 2. 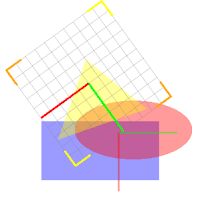 Combining multiple matrices result into one, new coordinate system. Where matrix X is used to draw the sub graphics. What happens behind the scene when the graphics is attached to control points? All matrix nodes got an 'Attach' action. This is used to 'glue' the matrix to control points. First, put the graphics you want to attach into a matrix node. Then, with bone tool, create two control points. The 'Attach' action creates a new matrix node named 'bodyMatrix'. 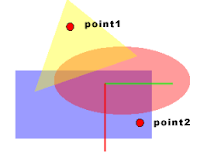 If we select 'bodyMatrix' we see the center is at 'point1' and rotating in direction of 'point2'. These epressions are executed at run time. Notice the properties of 'body' also have changed. This is to compensate for the Offset and Rotate property of 'bodyMatrix'. 1/A equals the inverted A matrix. 1 equals a matrix node with default values. Matrix math is not only used in Stickman & Elemento but in most 2D and 3D games. If you can't understand them, don't worry. It just works!